sailboat. : What I Wore: Orange and Mint. Nail Polish: Essie Mint Candy Apple. Everytime there is even the slightest glimpse of sunshine I get super excited. Sunshine filled days have been few and far between in my little part of England over the past couple of months, instead weeks upon weeks of rain and angry grey looking clouds have greeted me as I opened my curtains each morning. 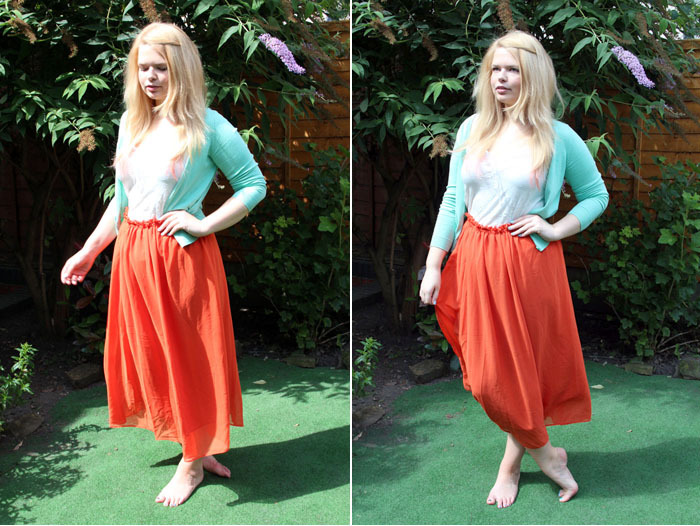 As soon as I saw the sunshine streaming through my window I was planning an afternoon picnic and I knew I wanted to wear this beautiful orange skirt from Sheinside. I've been saving it for a warm day and I finally got the perfect chance to wear it. The colour is perfect, I've always been a little afraid to wear orange shades, especially when they're so bright, but I'm not anymore because I adore this so much! I also really like the length, I think it's supposed to be full length but because I'm quite tall it sits just above my ankles which I found surprisingly flattering & pretty. This cream Vibrant Versatile Cami from Joe Browns is my all time favourite basic piece. These kind of camisoles are integral to my wardrobe, they go with absolutely everything and I especially love the subtle detail and variety of colours that Joe Browns stock. At £8.95 they're not the most affordable but I think they're so worth it because of the lace, adjustable straps & super cute effortless fit. I've currently got my eye on the pink, light lilac & turmeric shades! Are you a lover of basic pieces? I think basic pieces are so important in any girls wardrobe. If you find a good one stick with it! I absolutely LOVE the mint cardigan :) It also looks great on you! Very pretty outfit, I love the mixture of colours they work really well together. Such a pretty look, so summery and so lovely for a hot summer day! This such a beautiful outfit and I adore the combination of colours - the orange skirt and turquoise cardigan are lovely together and even the faint pink in the end of your hair against the white top just brings that little extra something! both of those colors are absolutely adorable! i'm following you on gfc now, please follow me too? :) i think you'll like some of my outfits! & you really remind me of a fairy! You know those flower fairies (if you ever read the books when you were a kid! ), I'm not sure which flower though haha! adorable :) I love the color you used in this outfit. i love basics too - i could live in v-neck tshirts haha! The orange colour looks gorgeous on you Jennie! Gorgeous photographs! I love your outfit, the colours work lovely together!